Easily check for any critical Windows updates. My Faster PC makes it simple to check for important Windows update. Just go to our System Info section and click "Check for Updates." Microsoft publishes patches, security fixes, and critical updates frequently. If you are not currently using automatic updates, this is a vital step to ensure system security and fix known errors and bugs. If you use Windows 8, Windows 7 or Vista, your system should automatically check for updates. Whatever version of Windows you use, it's important to turn automatic updates on or check yourself on a periodic basis. 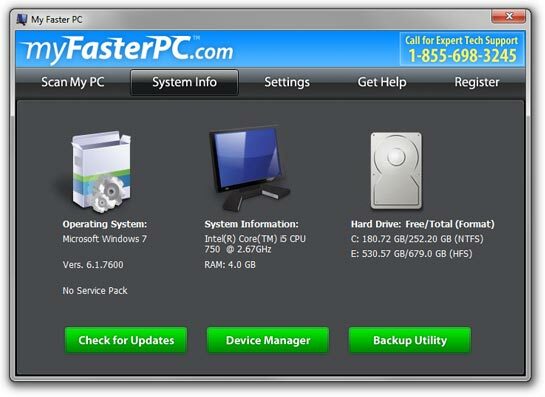 My Faster PC also provides information about your system and links to the Device Manager and Backup Utility. The Device Manger is used to manage, diagnosis, or troubleshoot hardware or devices attached to your computer. The Backup Utility lets you setup an automated backup using a local hard drive.